We are very happy to provide product loans and high resolution images for magazines, journalists and other press and further information about our products that may be required. Just contact us to let us know which products you are interested in and we'll be happy to help. 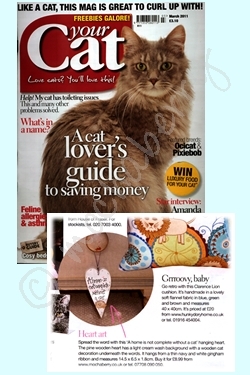 A recent article in "Your Cat" Magazine March 2011 featuring our lovely Cat Heart. Pine wooden heart with a light cream wash background. The heart has black wording with red hearts and stich markings around the edges with a wooden cat decoration underneath the words. The heart hangs from a thin navy and white gingham ribbon.